Inquiring minds are watching the implosion of Spanish bonds. 5.76% was the previous close. Yield is currently up 44.5 basis points at 6.2%. The high yield was 6.255%, easily topping the previous high of 6.09%. 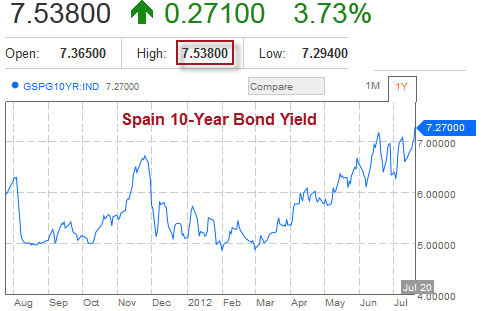 "The financial credibility of Spain is close to zero. Fiscal credibility is zero. The political credibility is zero. Investors have been sentenced to Spain. The Government has wasted no time in recent months has squandered the credit granting him an absolute majority, has lost some confidence in European institutions and the whole market with a succession of errors, many of them for a bad communication strategy is correct now without success. Too late? Can not say such things in public, but without a change of attitude are you doomed to a full recovery. " "I see little chance that Spain is free," says Ken Rogoff, a Harvard professor and head of the IMF execonomista. 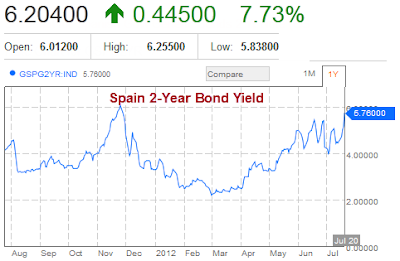 "Spain will continue with serious growth problems and stop until there is a massive deleveraging. This can be achieved with painful structural reforms, especially in the labor market. Also with a sustained inflation in countries like Germany, which can be ruled out given the degree of obsession with the ECB. And take away significant restructuring and debt, the best approach but politically the most difficult. Most likely, this is made more than a decade of anemic growth and high unemployment, combined to a greater or lesser extent with the previous recipes, "says Rogoff, who predicts a sort of social depression (if it is not as friction unemployment 25%). Wolfgang Münchau, who heads the think tank Eurointelligence Brussels, says the austerity measures at the trough "are really crazy, prolong and deepen the recession even raise the deficit contractionary effect. It is amazing that governments keep repeating mistakes made decades ago. " With these rods, there is little room: "Spain is no longer fully sovereign, because the government can no longer funded. Yes, I expect a complete audit, "says Martin Wolf resounding, economic commentator for the Financial Times header. As is typical, that translation is a bit choppy. However, one can surely get the gist of it. Also as usual, Wolfgang Münchau misdiagnoses the problem. Hiking taxes is a problem, but so is Keynesian claptrap. It is not feasible for governments to spend their way out of problems. Nor is it possible for monetary stimulus to solve the problem. If such proposed solutions actually worked, Japan would not be in dire straits today. Keynesian and monetary stimulus proposals are nothing more than gigantic can-kicking exercises. They only appear to work because experience shows the can will be kicked much further than anyone thought possible. The intermediate result is misguided faith in can-kicking. The final result however, is typically something that ends up like Greece or Japan, with can-kicking proponents like Münchau and Paul Krugman, screaming every step of the way for still more can-kicking as the solution.